Click Here To See Green Lantern #56 Comic Book! Check out this "HISTORIC" SILVER AGE 1967 LARGE ART DC COVER, which was penciled by the great Gil Kane, and inked by the great Murphy Anderson, from the story titled: "The Green Lanterns' Fight for Survival!" 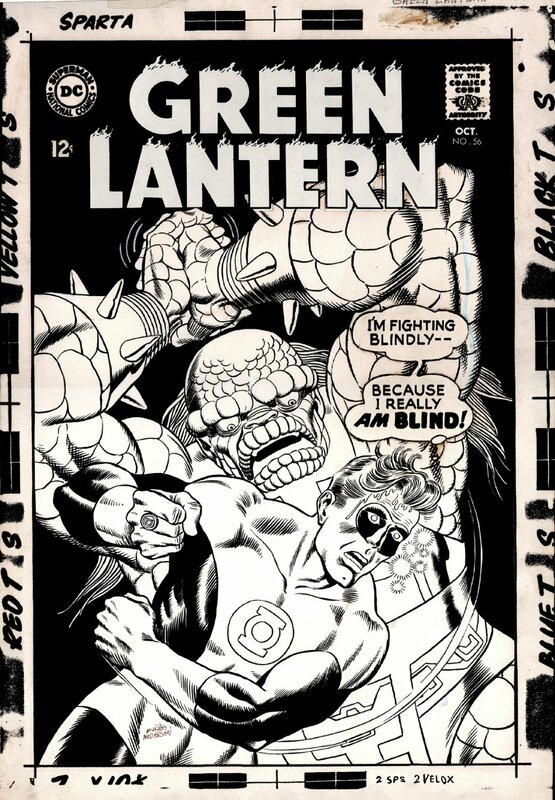 This AWESOME COVER is considered to be 1 of the very best Green Lantern covers known to exist that is offered FOR SALE in the comic art hobby! This masterpiece was also drawn by the 2 great artists who actually drew stories way back in Green Lantern #1 in 1960! This great cover, with awesome black inked backgrounds features a BLIND (Hal Jordan) Green Lantern fist fighting for his life against the giant (PREDATOR-LOOKING) creature known as ASHEZ! This ASHEZ creature oddly enough looks quite similar to Marvel Comics own "ABOMINATION" who Gil Kane FIRST introduced to readers in 1967, and who first appeared in Tales To Astonish #91, a mere 6 months before this great Large Art DC cover hit the news stands! TOP NOTCH SILVER AGE DC Super hero covers are VERY hard to find in the hobby these days, so don't miss out on a great opportunity here to own 1 of the GREATEST LARGE ART SILVER Age Gil Kane covers ever offered for public sale! ALL art on our website (including this one) are able to be purchased with VERY fair time payments, and trades are always considered towards "ANY" art on our website! Just send us an email to mikeburkey@aol.com and we can try to work something out.